The year 2013 marks the 60th anniversary of the ROK-US security alliance, which was officially established with the signing of the ROK-US Mutual Defense Treaty in October 1953. The number 60 carries significant meaning in Korea since it refers to the completion of one cycle of the zodiac and the beginning of a new one. For the past six decades, the ROK-US alliance has fulfilled its primary objectives very well, and it represents a great success story—the enduring alliance forged in blood. Of course, there were difficult times, when many were concerned with the future of the alliance, but we have successfully overcome those difficulties and learned valuable lessons for the future. Nowadays, the ROK-US alliance functions as the cornerstone of peace and stability on the Korean Peninsula and in the region, but it exists in a more complex environment, facing unprecedented challenges. The old threats—North Korean threats—have not disappeared. Rather they have become much more serious and diversified: bigger, closer, and deadlier. At the same time, in recent years, we have seen the emergence of new security concerns such as the rise of China, a shifting military balance amid uncertainty about the regional security architecture, and the rise of new, non-traditional security (hereafter NTS) problems. To tackle these different challenges, South Korea and the United States agreed on the concept of “strategic alliance” in June 2009 through their Joint Vision Statement and reaffirmed their commitment to it in the Joint Declaration of May 2013. The strategic alliance is still in the making. Continuous efforts are required for realizing the substance necessary for such a strategic alliance. In this first Topics of the Month essay and the monthly updates that follow, my goal is to reflect on the follow-up to the Park-Obama summit and suggest what “strategic alliance” should include in the rapidly evolving regional environment of 2013. In upgrading the ROK-US alliance, there are some lessons we must keep in mind. Among others, three dangers stand out: A lack of understanding of the ongoing transformation in international politics (changing challenges and ways to meet them); a lack of effort to narrow the perceptual gap, which contributes to the erosion of trust and confidence between the two allies; and the absence of a vision reflecting a common understanding for what lies ahead. The first results from a dearth of long-term analysis of the fundamental changes in our era and their implications for the alliance, often owing to an inclination to focus mainly on domestic elements in interpreting the resulting problems. As a result, constantly changing public opinion on specific issues overshadows discussions about the alliance, and, in analyzing and resolving the problems, it is hard to overcome dichotomies of the right vs. the left, conservatives vs. progressives, or pro-American vs. anti-American. Framing issues in this way hinders understanding of the reasons for transforming the ROK-US alliance, and, even more, for setting a suitable direction for the alliance transformation. The second lesson we can draw from the past is the importance of cognitive elements in maintaining and strengthening the alliance. Over the past two decades, despite all of the agreements, we have suffered from repeated erosion of trust and confidence between the two allies. A perceptual gap was its source, and little effort was generally given to finding a way to address it. Beneath the surface of the official statements and explanations of both the ROK and US governments during the period of the Roh administration, friction between policymakers as well as opinion groups in both countries went beyond simple policy differences. Both sides became very suspicious of the other’s intentions, sincerity, and integrity. This left emotional scars, which many assume were healed during the Lee Myung-bak period, but, I argue, remain not far below the surface and may burst out if a problem arises. The second lesson leads us to the third lesson: The absence of a vision for the ROK-US alliance that could serve as a framework for issue-driven adjustments. The Roh and Bush administrations failed to identify a rationale for the alliance as circumstances were changing or to forge common understanding of the desired form of the future alliance. This contrasts to the new understanding in the US-Japan alliance achieved during the 1990s, which breathed fresh life into those relations after the end of the Cold War. The alliance adjustment process in the 1990s-2000s between South Korea and the United States was driven by specific, often urgent, issues without a common vision to guide the alliance into the future. There is no rationale for transforming and strengthening the alliance, identifying respective roles, missions, capabilities, and strategies, and tailoring the structure of the alliance accordingly. There are at least three challenges ahead of us, all closely related to the lessons we have learned. First, it is necessary for the two allies to articulate a concrete action plan. What this means is that we must work hard to have a shared estimate of the mid- to long-term security environment ahead of us while working on pending issues. Of course, there will be differences between the two allies, as we have seen in the case of the comprehensive security assessment (CSA), but through such a process, it is possible to narrow the gap and enhance mutual understanding. Three issues must be seriously discussed: The North Korea question (or the Korean Peninsula question, including the post-reunification era); the China question; and the regional security architecture, including a mini-lateral security cooperation framework. In the following months, I will offer some suggestions for addressing these themes, which Americans may fear are too sensitive for South Koreans to address in the current environment. As we have witnessed before, ineffective handling of these issues can seriously damage the alliance, since they can have huge political impact. We should not try to impose one side’s position on the other. We need to take a cautious, thoughtful approach in handling these issues, driven by strategic thinking, mutual respect, a spirit of responsibility-sharing, and realistic assessments of the situation. Consultation, coordination, cooperation, and mutual respect (C3R) must guide us in finding solutions. Furthermore, we must think of damage limitation should some undesirable thing happen. Third, we must think of ways to strengthen domestic understanding and support for the alliance. To minimize volatility, as untoward events may occur, we should clearly and constantly provide a rationale highlighting the benefits of maintaining and upgrading the alliance. For that, it is necessary to put the alliance in a regional as well as global perspective, and it is desirable to expand the area of cooperation. Not only government-to-government but also people-to-people contact across various fields is necessary for enhancement of mutual understanding. We should keep in mind that public diplomacy is growing more important, even between the two allies. For a fruitful discussion, we need to get down to the specifics of how to realize these aspirations. As the ROK has become a global player, its interests are becoming more interlocked with those of the United States in global affairs, mostly on NTS issues, and it is ready to make greater contributions. So, there will be more chances to work together in meeting those challenges along with other, like-minded countries, which will contribute to upgrading the alliance. From traditional “mil-to-mil” cooperation to government-to-government and people-to-people cooperation, the alliance can grow more robust and comprehensive, which is what is meant by “strategic alliance.” Of course, we must keep in mind that what makes an alliance different from other relations is the military/security interconnectedness. Thus, the expansion of cooperation into other areas should not be pursued at the expense of military cooperation. Rather, we must think about the use of military assets in supporting the achievement of other objectives. The exchange of views that I am proposing encompasses specific bilateral agreements and coordination on broader regional and global challenges. As a step toward shared understanding of the transformation under way, I will offer some thoughts on what that might be. On reducing the perception gap, I will try to pinpoint some elements of it. As for a vision of the “strategic alliance,” I propose that this be our priority in the discussion ahead. Having argued that three issues must be seriously discussed, I am planning to make suggestions for each of them; on North Korea, on China, and on the regional security architecture. Above all, this exchange is intended to be a step toward clarity about difficult choices in order to narrow the perception gap. I hope that many of you will respond and join me in this undertaking. We have not yet had any responses to Choi Kang’s Topics of the Month statement, but the status of the alliance was intensely discussed at the Asan Washington Forum. With the views expressed there being summarized in the first two issues of The Asan Forum, we can put Choi Kang’s ideas in a broader context. The background article in the Open Forum by Choi Kang appearing simultaneous to this discussion informs these comments as well. Responses will be welcome for distribution on September 6 following the next installment of Topics of the Month on August 23. The triple shadow of China, Japan, and North Korea hangs over ROK-US relations. In ideal circumstances for the alliance, all of these sources darkening the horizon will blow away. In 2010-2012, they were all aligned nearly ideally for the alliance to prosper. North Korea was at its belligerent extreme. China showed little interest in appealing to South Korea. Moreover, until late in 2012 Japan-ROK relations were on the upswing. Talk of raising the alliance with the United States to a new level gained support in Seoul, as in Washington, but just holding onto what has been achieved is challenging in the new circumstances of more nuanced Xi Jinping regional policies, more divisive policies by a triumphant Abe Shinzo, and further uncertainty about the next moves of Kim Jong-un, three leaders who may have as much impact on the alliance as Park Geun-hye and Barack Obama in the coming few years. Choi Kang recognizes the more complex environment in which the alliance functions in 2013, pointing to that as a reason for forging the “strategic alliance,” as agreed in 2009. Yet, the complexities observed today are quite far removed from those just a few years back. In pursuing “trustpolitik” with Pyongyang and Beijing and rejecting Tokyo for its recent rhetoric, Park is acting in ways that deepen these complexities. One task that is proposed for strengthening the alliance is a more robust exchange of views. If differences over China are minor and some happy median is within reach after further exchange, then this advice is well taken. Yet, if China’s goal is to weaken the alliance, in line with criticisms found in many Chinese publications that this is a negative holdover based on “Cold War” mentality, then the problem will prove more difficult, as South Koreans may play into China’s strategy. At the Asan Washington Forum many comments on the Sino-US-ROK triangle warned of this complication. A second task before officials of the two allies is to agree on a vision for the alliance, but this is not easy in the face of uncertainty about North Korea. After all, there is still no purpose for this alliance greater than deflecting the threat posed by North Korea. Yet, in 2001-2008 disagreement on how to deal with North Korea shook the alliance more than anything else. If Pyongyang remains in a belligerent mode, as it has been in 2009-2013, or if it shifts to a cooperative mode emphasizing economic development and peace, then proceeding to develop a shared vision would seem to be within reach. However, if the threat perceptions to the two allies diverge sharply and South Korea switches to a mixed strategy leaving its intentions uncertain, what would be the common vision? In the second part of the synopsis of the June 24-25 forum, issues involving the ROK-US-North Korea triangle will be further discussed. A third task noted by Choi Kang is developing an action plan for a regional security architecture. With Washington urging Abe on as he expands Japan’s defense role and Seoul warning against his policies as if they will bring a rebirth of militarism, what kind of regional approach is possible? Differences in evaluating Japan were unmistakable at the Asan Washington Forum. Some consider this triangle the most important building block for regional security. In discussing regionalism, Japan has been prone to minimize South Korea’s significance. In considering how to manage North Korea, South Koreans now often leave Japan on the periphery. Focusing only on bilateral alliance matters when examining an action plan for regional security is a recipe for failure. Tightening Japan-US military cooperation must be a starting point. As Choi Kang points out, the US-South Korean alliance has turned 60. The pact has been a great success, shielding the ROK as it developed. That objective has been achieved. We must recognize that the world today is a lot different than it was six decades ago. The world has changed, so should the alliance. After the Korean War ended in an inconclusive armistice, Washington offered a “mutual defense” treaty to guarantee the security of the war-ravaged ROK. In those early years only the US promise to intervene, backed by a troop tripwire, prevented Pyongyang from renewing its attempt to conquer the entire peninsula. However, that world disappeared long ago. Once the South Korean economy took off in the 1960s the gap between the two Koreas grew ever wider. Two decades later democracy arrived, giving the ROK another advantage, while the end of the Cold War left the DPRK isolated from even its nominal allies. With this dramatic change in circumstances, the two nations’ relationship should evolve as well. Instead, alliance advocates have come to treat the military relationship as an end, rather than a means to an end. Today this means attempting to turn a local security guarantee into something much larger around the globe. Of course, the two nations have shared interests and values, but most have nothing to do with the military. In contrast, Washington and Seoul have very different security priorities: the United States is much more concerned about terrorism, the Middle East, and North Africa. The ROK places a priority on good relations with China more than with other US allies, which fear China. There still is room for bilateral cooperation, but it could be organized ad hoc when circumstances dictated, not presumed by an alliance to be automatic. While the benefits of a “strategic alliance” would be limited, the costs of such a relationship would be high. Every promise to go to war forces Washington to create corresponding military assets. Yet the US government is effectively broke and should not borrow money to provide military protection for a country that could provide for its own defense. Worse is the risk of war. At least in 1950 the Korean Peninsula seemed important for the global balance of power. Even if a new Korean war had an awful economic and humanitarian impact, there would be minimal effect on America’s security. A North Korean attack on the ROK would be just that, not the prelude to global conflict. The alliance also interferes with US relations with China, which perceives, not unreasonably, the enduring US troop presence as an American-led effort at containment. The alliance also results in conflict with Pyongyang. Absent US military involvement on the peninsula, it would not need a North Korea policy. Even if the North eventually produced an accurate long-range missile, it still would be suicidal to attack the world’s premier military power. Pyongyang is focusing its ire on Washington only because of this involvement on the peninsula. South Koreans also pay for America’s large-scale military presence. So-called host nation support covers 40-45 percent of America’s costs for stationing its troops. A Status of Forces Agreement limits ROK control over US military personnel, even those accused of committing a crime. Even the ROK’s policy toward North Korea is hostage to the alliance. The country with the most at stake obviously is the South. However, as Seoul’s big brother providing security, Washington is intent on influencing South Korean policy. After all, a mistake by Seoul could mean war for America. Moreover, the growing attempt to give the alliance a regional or even global role threatens to entangle the ROK in more wars in which it has no interest. Worst would be conflict with China over Taiwan or various East Asian territorial disputes. Seoul already has sent troops to Vietnam, Afghanistan, and Iraq to help ensure Washington’s commitment. Finally, one of the most important impacts of the alliance, on both the United States and the South, is to enable and even encourage the ROK to try to appease the North. Seoul long has underfunded its defense, allowing the North to enjoy a quantitative, if not qualitative, military advantage. For a decade presidents Kim Dae-jung and Roh Moo-hyun followed the so-called Sunshine Policy, providing roughly USD10 billion worth of cash, food, and other aid to the North. South Korea continued to operate the Kaesong Industrial Complex even after the North sank a navy vessel and bombarded an island in 2010. Should the alliance survive? While South Koreans’ desire for a cheap defense ride might override their desire to be treated as equals, the United States gains no comparable benefits for entangling itself in the Korean imbroglio. Seoul should take over responsibility for South Korea’s defense. Then the two countries could negotiate new, cooperative military arrangements as equals. An alliance serves the military strategies of allied countries. When their grand strategies are in transformation, both their military strategies and the corresponding purposes of the alliance are subject to change. The Obama administration's East Asian strategy, as is well known, has undergone a fundamental change. The new strategic purposes are: to revitalize US hegemony; to reestablish a healthy financial foundation for renewed leadership; to rebalance national power under stress; and, for all these objectives, to highlight the importance of East Asia. Key elements of the rebalancing strategy include: strengthening alliances; building strategic relations with emerging powers, especially China; establishing a favorable multilateral environment, especially through the TPP; and emphasizing norm-based diplomacy. As for the ROK-US alliance, all these elements have an influence. The alliance is to be strengthened, while the two states seek a common strategic viewpoint regarding the rise of China, work together to encourage China to be a responsible part of a multilateral framework, and articulate an inclusive normative framework for a regional consensus. After going through difficult times of alliance adjustment, South Korea is in the midst of articulating a new strategy. In the past, South Korea as a weak power could not help but care only about its own security and well-being. Expanding the strategic spectrum to both regional and global affairs is a recent phenomenon. As a member of the G20 and a host to the Nuclear Security Summit in 2012, South Korea slowly began to perceive itself as a player able to influence regional and even global affairs. If middle powers are considered to be countries that wield influence on strategic architectural issues at the regional and, to some degree, the global level, then South Korea is transforming itself into a middle power. 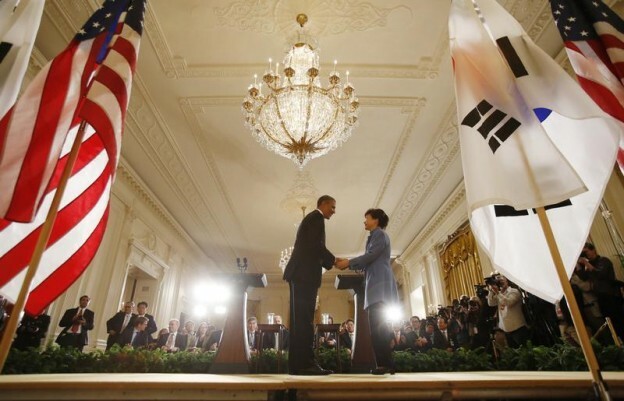 As President Park Geun-hye mentioned in the press conference after the summit with President Obama in May 2013, South Korea tries to perform its role as a "co-architect" with the support of the United States. When the new strategies of the two countries take clear shape, what will be the proper role for the ROK-US alliance? What can the alliance achieve beyond the narrowly defined purpose of deterring the North Korean military threat? How can the alliance contribute to future-oriented aims to smoothly manage the power shift in this region? Regarding these questions Choi Kang rightly addresses several crucial points: the countries need to share a common security threat perception; both have to redefine the alliance from a more comprehensive and normative perspective; both countries should address impending issues from the perspective of their respective, new grand strategies. All of this sounds reasonable in the abstract. Taking a closer look, we cannot avoid noticing that one important issue remains to be discussed: the rise of China and its regional impact. As China continues to modernize its military, the United States has been closely watching with the intention of balancing. More than any other country, China is in the forefront of immediate, potentially high-intensity regional conflicts: the cross-strait conflict and possible standoffs in the South and East China Sea. Both South Korea and the United States do not want these conflicts to escalate into a military clash, not to speak of all-out war. The two countries will exhaust all diplomatic means to solve the problem. However, to avoid military conflict, both countries should pay attention to these tasks: to persuade China that the role of the ROK-US alliance is to contribute to regional stability, not to contain China; to spotlight the need for multilateral, military cooperation especially with a view to raising the level of military transparency; and to seek common missions for regional human security such as disaster relief, nuclear security, and peace-keeping. Such moves to cultivate the culture of military cooperation will test China and the alliance. They should be at the center in discussions of how to strengthen the alliance.